This post was first published in March, 2013. Since then it’s been updated a few times. I taught a Lunch and Learn session called The Power of Twitter for Educators for The Centre for Global Education on November 6th 2013. It was based on this post. Here is an archive of the session. The slides are available here. Twitter is a crowd-sourced micro blog. Messages (posts) can include photos and links but they are limited to 140 characters or less, so they are short and often use txt speak. According to GlobalWebIndex Twitter is the fastest growing social platform on the planet. In Twitteracy: Tweeting as a New Literacy Practice, Greenhow and Gleason, conceptualize “tweeting” as a literacy practice, comprising both traditional and new literacies, and impacting both informal and formal learning settings. You can find out how and where people use Twitter in this article and infographic from Edudemic. Twitter can be a great tool for connecting with educators around the globe who share your interests. PBS Media Shift, in How Twitter is Reinventing Collaboration Between Educators, says “many educators say that Twitter is the most effective way to collaborate and that they’ve learned more with Twitter than they have from years of formal professional development.” But it can seem overwhelming when you first start to explore it. Fortunately, there are many different ways to use Twitter, with different time commitments. Here are some of the ways that you can use Twitter; for the first one you don’t even need an account. Tweetchat lets you explore Twitter without an account. You can use it to search people, topics or hashtags. Try it out. Here is a link to the chat for the Educational Technology and Media course (Etmooc) that I am taking right now #etmooc. 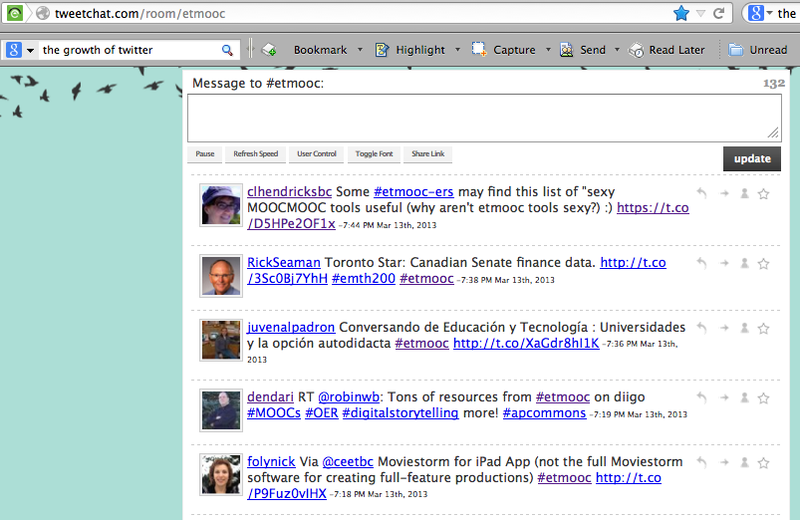 Anyone that wants to share with the 15,000+ people taking etmooc, can add #etmooc to their Tweets. Hash tags are used to sort content on Twitter, they always start with # (a hash tag) for example #etmooc. 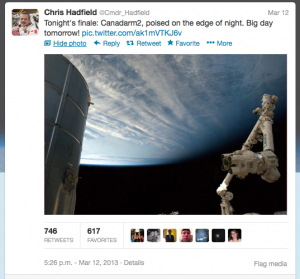 In Tweetchat, you can explore people like Commander Chris Hadfield, the Canadian Commander of the International Space Station who is Tweeting to over 500,000 followers from space. Usernames always start with @. You can also search trends, like idlenomore. The syntax of the URL is always “http://tweetchat/room/” + “whatever you are searching for” (this is where you add the hashtag, username or search term). 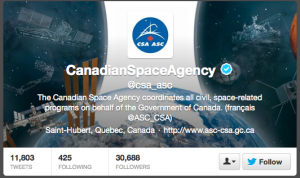 The URL for Commander Chris Hadfield’s Twitter stream is http://tweetchat.com/room/@Cmdr_Hadfield. Setting up a Twitter account is pretty easy. 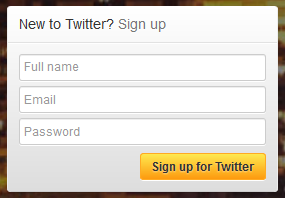 Go to Twitter.com, and type your name, email address and password into the dialog box, and follow the prompts. Once you have an account you can send a Tweet by clicking on the compose new Tweet button. Your Tweet has to be 140 characters or less; Twitter will count your characters as you type. Try to keep your Tweets to 130 characters or less, if possible. It is good etiquette to allow room for others to retweet your message (forward your message to their followers). Retweeting is usually indicated by RT @username:. In the #etmooc screenshot above, @dendari retweeted @robinwb’s message (“denari RT @robinwb:”). To send someone a message, type @their username in the message. To send me a message: include @rljessen in the message. In this tweet @MillerJulie, a teacher in Macau, China sends her first tweet. Following someone in Twitter means that their Tweets appear in your Twitter feed. I follow people, usually educators, who share information and resources that I am interested in. To follow someone, go to their homepage and click on the Follow button. You can go to someone’s homepage by clicking on their username or searching for them. Joe Bower from Red Deer teacher keeps a list of Alberta teachers who use Twitter; you might want to follow some or all of them. If you want to know about education in Alberta, follow @joe_bower. There are different approaches to who and how many users to follow on Twitter. Some follow celebrities, politicians or news agencies to keep up on the latest news. Some limit the number of people they follow, so that their incoming feed isn’t too large. I don’t worry about the number of Tweets coming in, I follow a lot of people. I follow educators because there is a huge group of educators who use Twitter to connect with other educators, share resources and opportunities and ask questions. Ready for more advice on using Twitter? 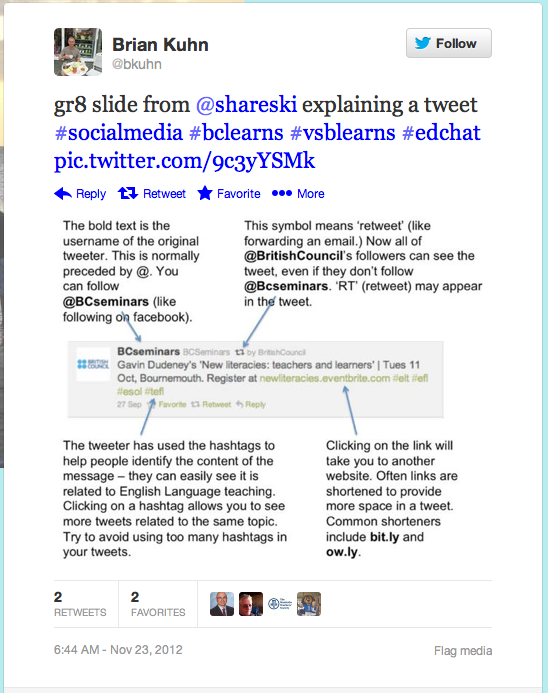 Educational Technology recently published 6 best Twitter tips every teacher should know about. When you first start using Twitter, your profile photo is an egg (because you have just hatched). Once you start using Twitter, you should change your username and add a short biography so others can learn about you (and decide if they want to follow you). You can change these settings by clicking on the settings button which is between the Search Bar and the Compose New Tweet button and clicking on edit profile. You might also want to take a few more steps to manage your on-line presence by setting up an on-line landing page with a service like About.Me, which provides a central point of contact for you on-line that users don’t have to log in to see. The link to my about.me page is on the right-hand side of my blog. You also might want to set up a gravatar, which is an internationally recognized avatar. George Couros, the Division Principal of Innovative Teaching and Learning for Parkland School Division recently wrote about actively maintaining your digital footprint. George is the creator of Connected Principals and the hash tag #cpchat. If you want to follow George, go to his Twitter home page and click on follow. Dean Shareseki recently posted this image describing the different parts of a tweet. I didn’t see the original tweet but I saw it when @bkuhn retweeted it. Dean is a teacher from Moose Jaw, Saskatchewan who works for Discovery Education. His username is @shareski, if you want to follow him go to his Twitter user page and click on follow. Once you are comfortable using Twitter you might want to step up your game by following more users and exploring Tweetchats which are Twitter conversations that take place at specific times that are associated with specific hash tags. This post explains about #edchat and #teachertuesday and it is a great introduction to Tweet Chats (which are sometimes called Tweet ups). If you want to learn about other educational hash tags, check out Edudemic’s 2012 list of Educational Hash Tags, which also includes a presentation which suggests ways to use Twitter in education. You can also explore this crowd-sourced Google doc which has an extensive list of educational hash tags. This is a video from Tech Soup describing how to participate in a Tweetchat. Here are a few tips for getting started on Twitter Chats. Once you start following people and groups, there can be a lot of information coming into your Twitter feed. You might want to try out tools like Tweetdeck and Hootsuite which help you manage the information stream. They let you set up different columns for different hash tags or searches. On my laptop TweetDeck has columns for #etmooc, #edchat, #edtech, #pbl, #pblchat – great resources about PBL with a weekly Twitter chat (Tuesdays at 6 pm MST), #scichat, #cpchat. There are also columns for my Twitter feed, my interactions (notifications that people are following me or have retweeted my messages), as well as all messages that have been sent to me. I used to worry that I would miss something if I didn’t check my Twitter feed frequently, but I have found that most good resources are shared more than once so I am no longer worried that I will miss a tweet about a fantastic resource or opportunity if I don’t check Twitter all the time. When you dive in deeply, Twitter can sometimes take over. Because I follow users who share useful information, when I check Twitter I often end up with a lot of tabs open, and I can spend hours following all of the leads. Instead I schedule regular time to devote to Twitter. I get to work early and check Twitter for 15 – 20 minutes in the morning before I start work, and sometimes check in throughout the day. I know someone who checks in on Tuesday (#teachertuesday). There is so much being shared, I always find something useful. Some people curate interesting information into digests that come out daily or weekly. Brain Pickings, is one example. Alec Couros, an education professor at the University of Regina, is one of the people running etmooc. He publishes a digest of the #etmooc Twitter feed every day. If you want to follow Alec, visit his Twitter user page and click on follow. Once you have a steady stream of relevant information coming your way you might want to share it with others. You can use tools like Storify and and paper.li to collect tweets, videos and photos and add your own commentary. As I wrote this post, one of my tweeps posted a link to Ten Comandments of Twitter for Teacherson #etmooc, and several others in my Twitter feed reposted it. This is a Storify I created after a recent etmooc Twitter chat about Digital Literacies. I also curate information in blog posts. I recently wrote this post about the Open Educator’s panel discussion for etmooc which includes an archive of the video, a link to the crowd-sourced notes and a Storify I made with the Tweets sent during the session. After Google announeed that they were shutting down Google Reader on July 1st, Ben Rimes curated this Storify, withalternatives to Google Reader. Some people send out tweets when they are at conferences and events to share their learning. Langwiches created this infographic about ways to attend PD, in person and virtually through the Twitter feed. This post has instructions on how to live tweet an event. If you are interested in building your brand, this Infographic explores how to use Twitter to build your brand (it is not from an educational perspective). Twitter can be used in all grades. Kathy Cassidy wrote this post for Powerful Learning Practice about how she uses Twitter in Kindergarten. If you still need some convincing to try Twitter, read 10 Minutes of PD That Can’t Be Beat by Melissa Halcott ‏(@Mkhalcott). 13 Responses to "The Power of Twitter for Education"
Great summary and instructions for people new to Twitter! I wish this had been available when I started. Just wanted to add one more resource: Cybraryman’s list of education tweet chats. It lists all the various tweetchats, including by day, so people can find the ones they’re interested in. The site is currently asking for updates, so it may not be completely right–but it’s a good start. Thanks for the cybraryman link Christina, that’s a good resource. Nice diagram Nick, thanks for sharing it. You have done a really nice job of giving a basic overview of Twitter. I till be referring others to your post! The following link supports your contention regarding Twitteracy. It is to an excellent article about how Twitter is reshaping storytelling. http://www.fastcoexist.com/1682122/how-twitter-is-reshaping-the-future-of-storytelling.